The Valdai Discussion Club and the Indian Observer Research Foundation (ORF) have launched a new bilateral expert project. 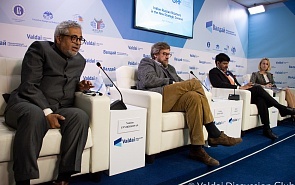 On April 9, 2019, the Valdai Discussion Club hosted a conference, titled “Indian-Russian Relations in a New Strategic Context”. Relations between Moscow and Delhi are developing within a complex international context. It is one that has been determined by the trade and economic wars of many players, friction stemming from the growth of China, the migrant crisis in Europe and transatlantic relations. The most important element of the new strategic situation is the rise of India and China, as well as Russia’s re-emergence as one of the world’s key players in politics and diplomacy. Developments in the Indo-Pacific region have led to key geo-political and geo-economic changes, prompting analysts and officials to address the matter with a special initiative. At the same time, Moscow and Delhi have demonstrated a willingness to express similar positions in leading international organisations, they actively cooperate in the framework of BRICS, the Shanghai Cooperation Organization, and RIC (Russia-India-China).